Planning active vacations, walking between destinations, eating meals in, packing healthy drinks and snacks, and bringing athletic clothes and gear along are all practical ways to stay healthy while on vacation. …unless you’re feeling sluggish and out of shape. Summer is the time of year everybody looks forward to, and, with beach trips and sunbathing on the agenda, it’s the time of year that inspires many people to get in shape. Unfortunately, sometimes the vacations that make for summer highlights can also compromise the progress you’ve made to stay fit and healthy. But, if you know how to stay healthy on a vacation, it doesn’t have to be this way. In fact, there are ways to plan a vacation in which you come back healthier and in better shape than you were when you left. If you’d like to enjoy summer without sacrificing either the fun of a vacation or the health you’ve worked hard to earn, try following these helpful tips on how to stay fit on vacation. If you’re asking how to stay healthy on a vacation, the answer might be right beneath your feet. That’s right–walk! This might seem like a small detail that wouldn’t have a huge impact, but an average of 65-100 calories are burned for every mile you walk. Vacationing by foot is especially easy on city vacations, where most attractions are centrally located (and where the hassle of traffic and parking means walking will likely save time)–but it can be done elsewhere, too! If your favorite picnic spot is a half mile from your cabin, do you really need to load up the SUV and drive? 2. Plan an active vacation. Hiking. Camping. Scuba diving. If you plan a healthy family vacation that’s centered around activity rather than lounging, you’ll likely come home in better shape than when you left. If you want to experience a great active vacation, look no further than America’s national parks, national forests, and state parks, where opportunities for hiking, camping, and active recreation abound. And after all that activity– you can lounge all the harder at the end of the day, guilt-free! 3. Plan meals–don’t just eat out! Wondering how to eat healthy on a vacation? You might not like the answer. One of the best ways is to reduce the number of meals you eat out. The calorie intake for adults in the United States tends to increase by an average of 200 calories when eating out as opposed to eating in. So if you want to know how to stay healthy on a vacation, consider spending more meals in. Grabbing a burger at the beachside shack or having a seafood dinner is certainly fun–and part of the vacation experience–but cooking a meal together is great fun, too; why not spend a few more nights in? 4. Pay attention to snacks and drinks. Healthy vacation food and healthy vacation drinks are essential parts of how to stay in shape while on vacation. Let’s face it: it’s not much of a vacation without plenty of snacks and drinks on hand. Plan ahead and buy healthy snacks like veggie trays, crackers, and hummus rather than just grabbing a bag of chips; for drinks, the most important thing is to ditch the soda–instead, turn to water, juice, or homemade smoothies. When making mixed drinks, pay attention to mixers and sweeteners; cut out unnecessary syrups and soda mixers in drinks like sangria–trust us, it’s still delicious. 5. Bring your activewear & gear along. This one’s easy: don’t leave yourself room for excuses. If you have your active clothes and gear with you and an opportunity for exercise presents itself (empty downtime, a hotel gym, a great trail to run on), you can take full advantage–sans the usual “if I only had my running shoes on me” excuse. 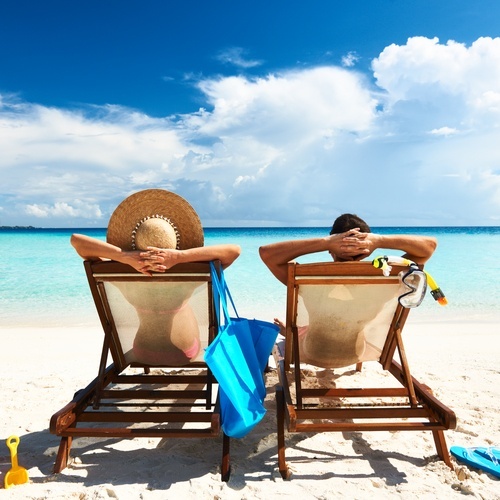 These are just a few ways to stay healthy on a vacation–it all depends on the location and activities of your vacation, but the key thing is to be intentional about including exercise and avoiding too much unhealthy eating and drinking. If you pay attention to opportunities for healthy change, you’ll have a great vacation you can feel good about. And if you need any help implementing healthy changes in your home and work life, Wellworks For You is here for you!